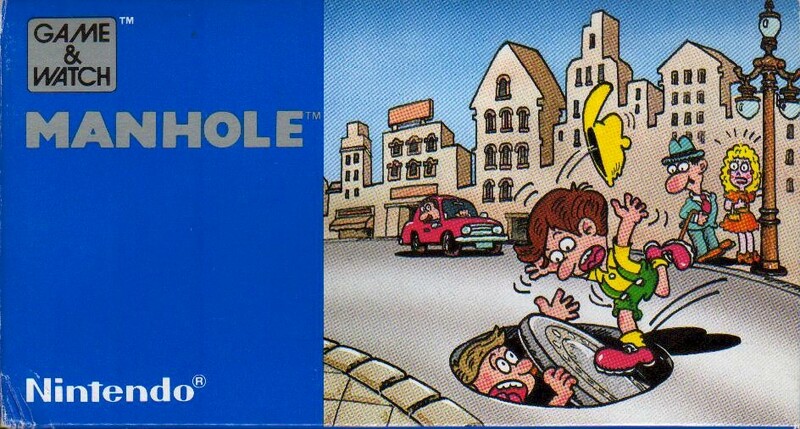 Manhole is one of the earlier Game & Watch games and it’s not one of the ones which really gets acknowledged very often in more recent Nintendo games. You might think that this one’s a bit less good, since it doesn’t get referenced all that often and, sadly, you’re probably right. It’s not a particular favourite of mine. In this game, there are two paths with two manholes in them. People walk along one path in one direction and the other path in the other direction. You play as a generic person (possibly Mr. Game & Watch) and you have a manhole cover – you move between the four different manholes and have to ensure that nobody falls into them. Left to their own devices, the people walking along the paths will walk right into the manholes. With so many people walking along both paths, you have to move quickly between the four holes, as you can only cover one hole at a time. You have three lives and you lose a life every time somebody falls in. I found this to be a fair bit more harder than the average Game & Watch and it took me quite a while to master. The problem is, that it also feels very slow when you first start playing. There aren’t many people walking by and they don’t walk quickly at all. But then after spending a while playing at the slow and boring speed, it suddenly gets pretty hard. It’s not great.